*The Nauceans refuse and go through a period of isolationism. They now are in the process of self sustained regions of space in which they do not need to expand anymore and can be a self sufficient empire. They still trade within CAB but are focused on preserving the culture of the Nauceans before it is lost to the universal culture. Also they have been playing around with time manipulation within their region so they are getting a better understanding of their place in both the universe and time. Today during a car drive I sorta half fell asleep, and my daydream had ALOT to do with Nauceans. Heh... that could be a TV show. "Now Jeannie, promise that while I'm out, you won't conjure up a group of Naucean and play tricks on the Cheif." Just the Ocean tribe in the shallow sea. Discover fire and tribes on land. Discover copper metals for weapons. Discover Farming and ship building. First true cities surrounded by walls. Castles and the 3 Kingdom Ruler. The invention of gunpowder and great wonders. Discovering the new world and pirates. First steam powered machines and plantion slavery. First World War and tanks. Cars, pop culture and 1st deep sea submarine. Holospheres, internet and mega cities. Genoside plague and World War 3. Uprising of the androids and World War 4. 1st contact with aliens and leaving the solar system. Colonization of near by solar systems as well as the building of the first Mother Sphere. Necromonicon War and creation of the Timesphere Po. Nauceans go back in time, mess with the space time continuim and come back to find that they have made themselves the Supreme Rulers of the universe, tah-da! Durring the Rocket Age and into the Modern Age the Nauceans visited the planets within their home solar system. The first place was the smaller moon Sina which the Cave Tribe which made it first the Desert Tribe to the Larger moon Sirenia 1st. This picture shows the River Tribe landing on their larger Moon Sirenia and claiming their part of the moon. Due to the competition there was a huge land grab for space, just like in the times of grabbing the new world during the exploration age. The River, Desert and Grassland tribes claimed parts of Sirenia while the Cave and Mountain Tribes claimed parts of Sina. This continued for the claiming of land on the neighboring planet of Whiro during the Modern Age, Oro and tis moon Fati during the digital age and many more up until the Genoside Plague the Desert tribe unleashed durring the Biotech Age which wiped out all the cave tribe on Nauceania. Luckily some did managed to survive on the Moon base of Sina. Space travel took a pause during the robotic uprising too where inter planetary travel was suspend so the robots could not escape. So some of the cave nauceans did survive, neat! Durring the Emancipation Age the first world war occurred and fighter planes were developed. The picture shows the first of this generation with the Air-Wing Biplane. 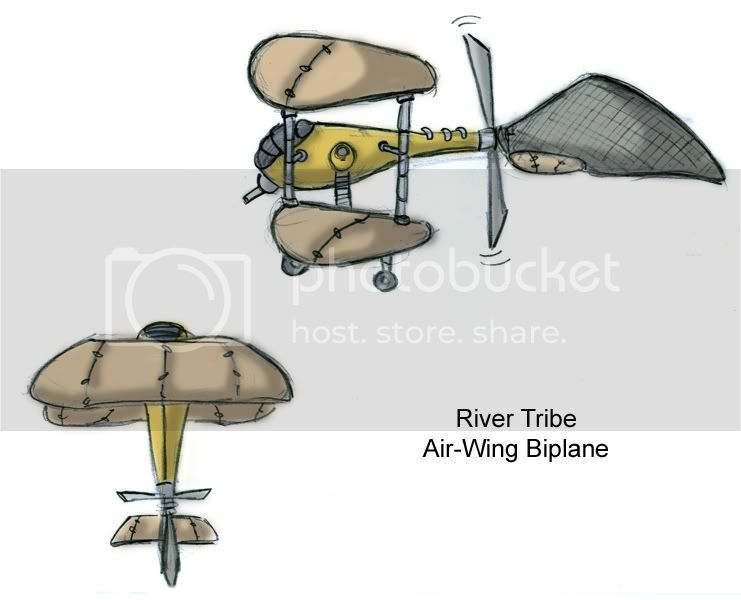 It is called an air wing because the wings are filled with air like a balloon of an airship. The propeller is near the back with an airship like rudder in the back. Like the air ship it has an air cannon. The craft can hold 2 Nauceans (one pilot and one gunner) it also can hold enough ammo. Unlike the air-ships that ran on steam power the bi-planes ran on combustion engines (just like the dome tanks of this age). Naucean Pilots were very brave an many lost their lives during this first war. During this time the first air battles happend to where they would chase each other through the air. One of the more famous squads of biplane pilots during the Emancipation Age and the 1st World war were the Silver Squaks (named after the Nauceanican animal) who painted their plains a silver color to blind their opponents in the shine of the paint. The parachute was also invented during this period after learning from air ship crashes of the Flight Age. Their parachutes were very similar to Earth's but were a but more spherical in shape. Lol, now you gotta draw two wright brother equivalents! Cool pic! The pictures no longer work. I think Spore Planet is down. They look like they're working fine to me. All those pictures are great, Hydro. I especially love the plane. I've always been into aircraft, whether it's dawn of flight or modern fighter craft. 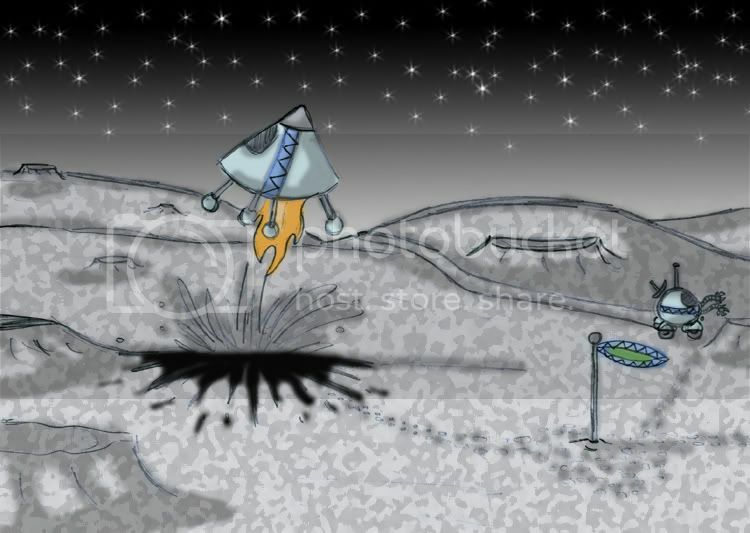 The moon landing picture is cool too. It's nice to see that some of the races that got wiped out on the planet at least somewhat survived on the moons. Just so the author knows, the Naucean has been chosen as a creation of the week on SporeWiki. See this creatures page on the wiki.